The Bill you are about to pass into law is an unjust one (…) Therefore it grieves us to warn you that unless your Government withdraws this Bill, it will be necessary to remove you, and not alone you, but any other person who undertakes to carry into law this unjust measure. “IT IS IMPOSSIBLE NOT TO BE THRILLED BY EDGAR WALLACE” proudly declares the back of my edition of The Four Just Men. Indeed, back in his day, Edgar Wallace was a wildly popular author. Even Hitler was a fan of his work—although you’ll never see that on a dust jacket! An enormously prolific author, Wallace holds the record among 20th century authors as the one with the most film adaptations based on his work. He’s even more known today for the role he played as the co-creator of King Kong… and then there’s the Four Just Men series, which began with The Four Just Men in 1905. Julian Symons might scoff at this point—Wallace can’t be a real writer! He was too popular! And he has a point, in that Wallace’s output is so immense that the quality is highly variable. But one thing remains constant, and that is the factor of unadulterated fun that goes into reading an Edgar Wallace adventure. The Four Just Men is just that—incredibly fun. There’s even an impossible crime thrown into the mix—but more on that later. The titular quartet is a group of men who are out to assassinate the Secretary of State for Foreign Affairs. (A cheerful proposition, that.) Their reason: the Secretary, Sir Philip Ramon, is championing a bill that would effectively extradite revolutionaries to their home countries, which are under a merciless, corrupt regime that needs to be quashed. Sir Philip’s intentions are not evil, but the way they see it, a great injustice will take place should the bill pass. So they offer Sir Philip an incentive for not passing the bill. But unfortunately, Sir Philip is a pig-headed man, who doesn’t know whether to believe in a Heaven or Hell. But he reasons that Hell might not exist, and since he knows how displeased some diplomats will be should the bill not pass, it would be in his interests to get it to pass after all. This means war, naturally, and the Four Just Men continue to taunt Sir Philip with note after note, calmly announcing his death should he not back down. And eventually this leads to Sir Philip’s death in impossible circumstances, despite being guarded by practically all the policemen available! Wallace ended his book on a cliffhanger. If you were a reader in 1905, you did not find out how Sir Philip was killed… Instead, there was a contest where Wallace offered prize money to readers who solved the case. 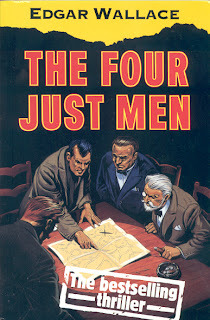 This plan worked in that it made The Four Just Men an instant bestseller. 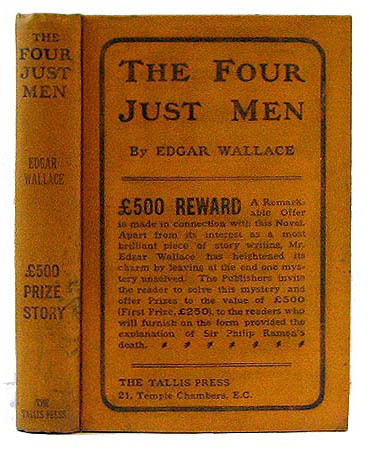 But it backfired big-time, as Wallace did not count on so many people figuring out the solution… and due to the wording of the contest’s rules, paying out the prize money nearly bankrupted him! (In fact, when he died, Wallace’s estate was literally nothing but a mountain of debts!) For once, Wikipedia has a good article on this mess without spoiling the solution. But frankly… Wallace did not hide the answer very well at all. It screams out almost at once, and it really astounds me that the medical examiners failed to figure out just what this mysterious thingamajig on the corpse was. This is also the only book I can call to mind in which an electrician at one point declares that he’s “given up trying to account for the vagaries of electricity”. And there is plenty of social satire. I absolutely love the scenes in Parliament, especially when the Four Just Men make a guest appearance near the beginning. There’s also a priceless bit in Parliament with the Prime Minister late in the book. There’s another great part when policeman arrest a pickpocket and he is greeted with fake joy at the police station— which quickly becomes genuine when the police realize that the pickpocket can identify one of the Four Just Men! And it’s important to note that all this is lovingly written with a sense of, above all, fun. I really can’t emphasize that enough. It’s a quick read and highly entertaining. Wallace isn’t aiming for anything more. This isn’t a brand of hopeless literature that aims to tell us that we’re all dull as death and deathly dull. 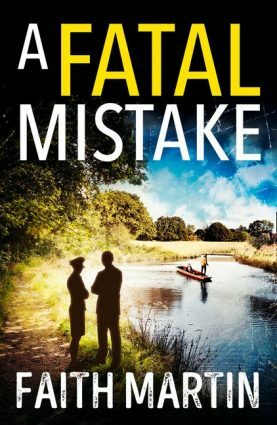 This is a fun thriller-mystery-adventure hybrid, and although the mystery is not quite the success it might have been, it really doesn’t detract from the fun qualities. The social satire and the interesting commentary on justice are also well worth reading. Overall, I can’t think of a reason to not read the book. After all, it is impossible not to be thrilled by Edgar Wallace. It's interesting reading the book these days, as the Just Men are essentially terrorists! In the Edwardian era it was still possible to romanticise characters like that, but after WWI it was no longer possible. In the later books they become almost respectable, and in fact they come to resemble a lot of much later book/film/TV heroes (what is LEVERAGE if it isn't a sort of update of the Just Men?) Edgar Wallace is one of those not-quite-respectable writers who nevertheless have had a big impact on popular culture. I've noticed some reprints of his stuff beginning to creep back into circulation, and I just hope that it will continue. 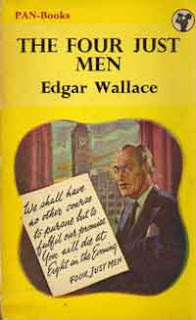 Edgar Wallace is one of my unsavory pleasures - you feel that you SHOULDN'T really be enjoying his work as much as you do. May I recommend his books featuring Mr. J. G. Reeder, an investigator who always explains, apologetically, that he has a "criminal mind," which is why he is so successful as an investigator. As you say, the books do vary pretty wildly in quality, not to mention fair clues and such things, but they are always great fun. Hi Patrick - this is one of Wallace's most entertaining books - really glad you enjoyed it as it's always been a favourite of mine. I see that the Symons-baiting continues (er, unabated ...). He actually has some pretty nice things to say about Wallace's books and is even pretty generous about John Creasey, who wrote about twice as many books as Wallace (600 plus apparently). I suspect our definitions of the world 'liberal' may vary as the Just Men are, like most of these kinds of heroes, basically just a bunch of Facists! 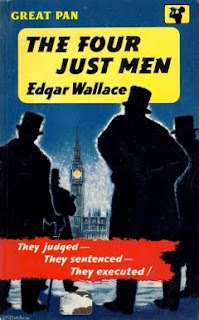 I have wanted to sample one of Edgar Wallace's thrillers for ages, but in the end I always pass him up in favor of either established (mystery) writers or promising new names. Maybe I should finally take that volume of Mr. J.G. Reeder from the shelves. Anyway, thanks for the review. You might, once again, have upset my reading schedule. Well, I meant the choice of term "interestingly liberal" to be an ironic expression. Irony, it seems, doesn't transfer well to that particular statement. It's odd, isn't it, how obvious it is? When I first read it I was expecting the method to be obvious simply because of the challenge (just like how it's easy to guess the end of a film with a BIG TWIST if it's advertised that there is one) but I think it would be obvious even if you weren't actively encouraged to think about it. Do you think Wallace really thought that it wouldn't be solved? He did seem pretty big-headed from the various biography snippets I've read. I actually read this in French (terrible translation) and I must say, I'm still not sure what the solution is. How can I found out? As it happens, I believe the book is in the public domain. At any rate, it can currently be found in places like archive.org, and you should be able to read the solution there.